Introducing the 4WARD Graduation Scholarship. When you complete your first two years successfully, Eastern will pay for the last two years. Text 4WARD to 467-467 for more information. EMU charged tuition at approximately $413.60 per credit hour for the 2018–2019 academic year. The above example is based on a student taking 24 credit hours per academic year, the minimum required for full-time student status. All students are automatically considered for the Emerald Scholarship upon application for admission. This scholarship, based on a combination of GPA and SAT/ACT score(s), is a four-year award of $2,500–$8,000 per year, depending on your eligibility. Text your graduation year (e.g., 2019) to 467-467 to see your estimated scholarship! Students with a minimum 3.0 GPA and 1030 SAT/20 ACT score will be given the opportunity to opt into this scholarship instead of receiving their Emerald Scholarship. When you successfully complete your first two years, Eastern will pay 100% of your next two years of tuition. Students are required to live on campus for four years, with options ranging from suite-style residence halls to fully furnished apartments. Learn more at emich.edu/4ward. For Michigan and Ohio residents only, this scholarship is awarded to students with a minimum 3.0 GPA and 1030 SAT/20 ACT score who are also Pell Grant eligible per the FAFSA. The EFOS Scholarship covers the difference between tuition and the amount of your Pell Grant. 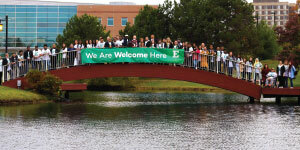 For more information on EMU’s scholarships, visit emich.edu/scholarships. We encourage all applicants to submit the FAFSA (fafsa.gov) to EMU using the code 002259. Some of our scholarships—like the EFOS and housing grants of up to $5,000—are dependent on the FAFSA. At Eastern Michigan University, we expect just one thing of you: to be true to you. To explore new horizons, to learn new things, to earn every ounce of what you deserve, and to do so grounded in what’s real. Here you’ll find confidence in being certain. You’ll stand beside professors who believe in what they do. You’ll discover what you’re meantto do, create, or make better. We’renot asking you to change—we’re asking you to grow. To never trade authenticity for approval. To earn your future. To always be undeniably true to you. • The College of Arts and Sciences, EMU’s largest college, offers dynamic academic programs in the arts, humanities, social sciences, and natural sciences. • EMU’s College of Business offers acutting-edge curriculum that equipstoday’s students for tomorrow’s global business environment. • Inspire the next generation of successwith a degree from the College of Education. For over 170 years, ourgraduates have been some of themost highly sought-after educational personnel in Michigan, across the country, and around the world. • In the College of Health and Human Services, you will become part of personalized, industry-leading academictraining for the health and human services professionals of tomorrow. • The College of Technology at EMUcultivates intellectual and personalgrowth, offering research-informededucation; a welcoming, collaborative environment; and myriad programs focused on the practical application of scientific knowledge. • The Honors College at EMU provides a small-college experience with all the benefits of a large comprehensive university. Ypsilanti is a culturally diverse community offering rich traditions, neighborhood shopping, museums, and unique annual events. Just minutes from town, you can find golfing, mountain biking, canoeing, and hiking. 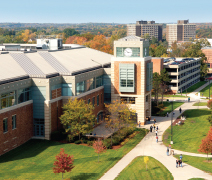 Campus is located 10 minutes from downtown Ann Arbor and 45 minutes from Detroit. From Depot Town to downtown Detroit, there’s culture in every direction. Living on campus puts you amongyour peers in the center of it all. Be within steps of fantastic dining options, recreational and health facilities, and the Student Center. From traditional residence halls to fully furnished apartments, from themed living and learning communities to suite-style rooms, living on campus gives you the full Eastern experience. Going to college is all about exploring your interests. No matter whatyou’re interested in, you’re likely to find people who share your passion. Learn about particular fields of interest, develop new skills, network with faculty and staff, make friends, and have fun. With more than 200 student clubs and organizations, there is something for everyone, from intramural sports and academic honor societies to community service organizations and cultural identity groups to music and arts and Greek Life. Explore your passions, find your group, and enjoy the ride. You can apply for free at emich.edu/selectscholars. No essays or letters of recommendation are required—and you’ll automatically be considered for scholarships!